The Enterprise Program will be hosting Altair’s Training and EDU Technical Relations Manager, Erik Larson, November 14 and 15 for a two part industry speaker series event. 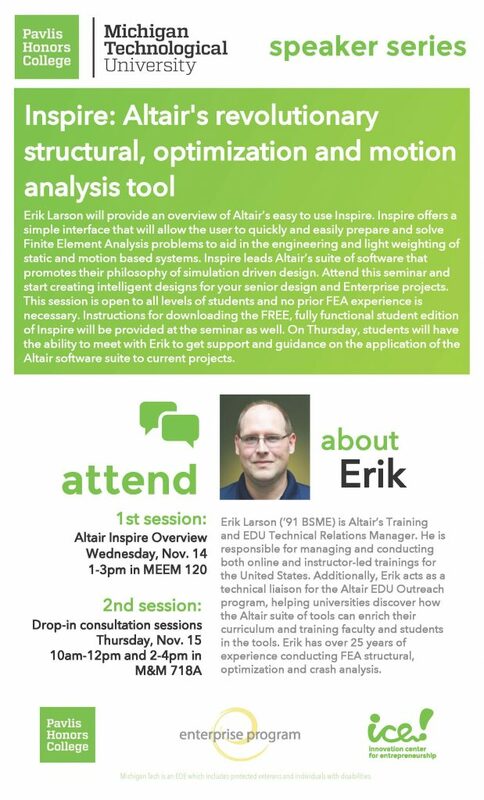 On Wednesday, November 14 from 1-3pm in the Active Learning Center (MEEM120) Erik Larson will provide an overview of Altair’s revolutionary, easy to use, structural optimization and motion analysis tool, Inspire. Inspire offers a simple interface that will allow the user to quickly and easily prepare and solve Finite Element Analysis problems to aid in the engineering and light weighting of static and motion based systems. Inspire leads Altair’s suite of software that promotes their philosophy of simulation driven design. Attend this seminar and start creating intelligent designs for your senior design and enterprise projects. This session is open to all levels of students and no prior FEA experience is necessary. Instructions for downloading the FREE, fully functional student edition of Inspire will be provided at the seminar as well. On Thursday, November 15 from 10am-12pm and 2-4pm in M&M 718A students will have the ability to meet with Erik to get support and guidance on the application of the Altair software suite to current projects. Erik Larson (’91 BSME) is Altair’s Training and EDU Technical Relations Manager. He is responsible for managing and conducting both online and instructor-led trainings for the United States. Additionally, Erik acts as a technical liaison for the Altair EDU outreach program, helping universities discover how the Altair suite of tools can enrich their curriculum and training faculty and students in the tools. Erik has over 25 years of experience conducting FEA structural, optimization and crash analysis.